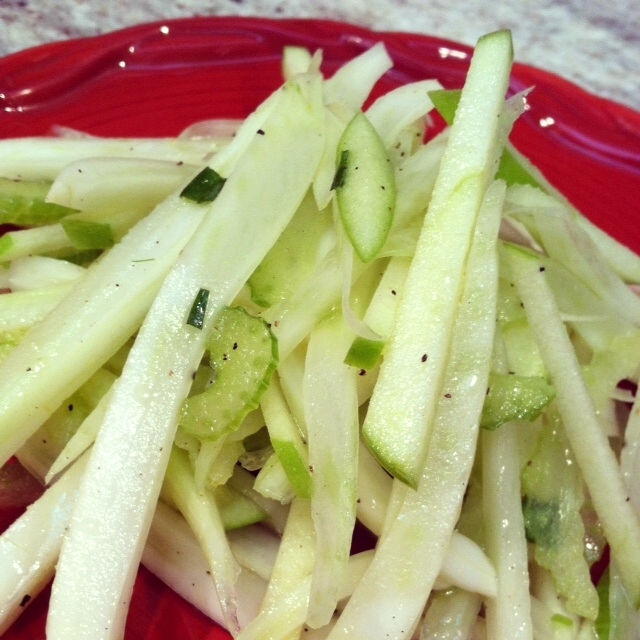 How perfect is this green Fennel and Apple Slaw for St. Patty's Day? Another great dish that I picked up in cooking class last night (courtesy of Jan Tang-Sayvongsa). This class has been so much fun... having the chance to sharpen up my knife skills and experience new flavor combos like no other! And this slaw completely put my cutting skills to the test but also woke up my sometimes simpler pallet. Packed with sweet, tangy, peppery and sour flavor combos, this slaw is going to be fun and tasty for the upcoming green holiday and even better for a hot summery day. In a medium bowl, whisk together the olive oil, vinegar, tarragon, lemon juice and sugar. Add the celery, fennel and apple. Toss to coat. Season with salt and pepper. It's that easy!